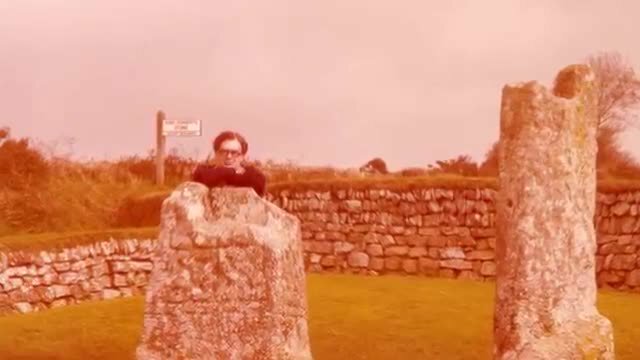 Adam Scovell recently posted on his “Celluloid Wicker Man” blog what he calls “Robert Aickman’s Holiday Photos”. He is entirely right to suggest that the photographs are atmospheric and open to interpretation. 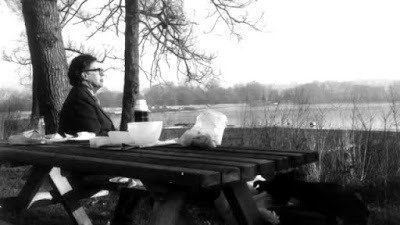 We are privileged to see Aickman relaxed, on outings for pleasure, but we can never quite know what he is thinking, or share anything really tangible of his experiences. It is tempting to project our own ideas onto the photographs, informed by our reading of the author’s strange tales. Scovell’s own interpretations are poetic, and he is clearly sympathetic to Robert Aickman and his strange fiction. But the photographs are not quite as mysterious as he would like to make out. All of the images have been ripped from Robert Aickman: Author of Strange Tales, a documentary made by myself and Rosalie Parker for Tartarus Press. (You can watch the whole thing here). Despite claims that nobody knows who took the photos, the film makes it obvious that they were all made by Aickman’s close friend, Jean Richardson (who owns the copyright on them.) 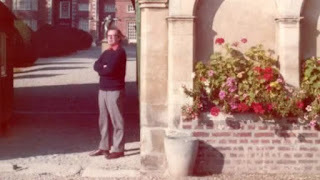 They document a period from between 1975-1979 and were taken on a number of different “Trust House Forte Bargain Breaks” that Aickman took with Richardson. Jean gives a full account of her relationship with Robert, and context to the photos, in her essay in the Faber paperback reprint of Cold Hand in Mine. Adam Scovell reproduces the image of Aickman at the Grave of Copenhagen, the Duke of Wellington’s charger, and he is quite right to suggest that “Even writing the phrase ‘the grave of the horse’ seems impossibly Aickman-esque.” As the Duke of Wellington’s charger apparently died of eating too much cake, the whole story becomes even more surreal. 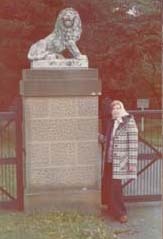 Unfortunately, the Copenhagen photograph is used to try and pin down the location of the other photos, and it is assumed that they were all taken on the same trip. Seeing Aickman at the coast, it is assumed that he was somewhere on the South Downs, and it is believed that the image of him relaxing on a menhir was also nearby. 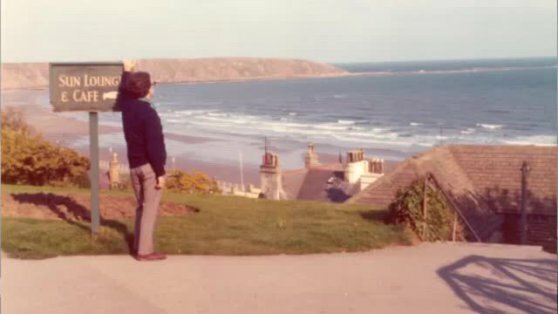 However, the seaside photo was taken at Filey in East Yorkshire, while the other was at St Coleer in Cornwall. They are 400 miles from each other, and the photos were taken four years apart. 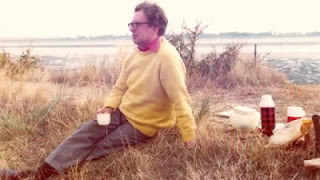 The blogger has been led astray by the hard-wearing nature of Aickman’s blue pullover. (Or am I making erroneous assumptions—did Aickman have more than one blue pullover?) It is just as misleading to use the frequent appearance of Aickman’s tartan thermos flask to link photographs. Robert Aickman with his thermos flask. "‘The Unsettled Dust’ is based upon a visit to Wimpole Hall . . . The dust in the story is authentic . . . ‘The Houses of the Russians’ . . . is based upon the Finnish town of Savonlinna. . . . The cathedral in ‘The Cicerones’ . . . was at Antwerp, but the events described in the story happened to me so precisely (almost) that I moved the whole thing, including all the detail, to the cathedral at Ghent . . . There are such establishments as are described in ‘Into the Wood’ . . . The town referred to in the story is Östersund, which, in my opinion, is much as I describe it, and the lake is Lake Storsjön, complete with monster (visit the local museum for further details). . . . Everything in ‘Ravissante’ is topographically correct, and all the Belgian painters named, exist; their works being every bit as remarkable as is implied . . . ‘The Inner Room’ . . . is based simply upon looking into the window of a toyshop in Hounslow . . . About ‘Never Visit Venice’ I can only remark that the ‘large inscriptions daubed by supporters of the previous Italian regime’ were still in the position described when I was there in about 1962. . . ."
My favourite line in the whole “Celluloid Wicker Man” blog has to be the one in which Aickman is described, in the snapshot taken at the grave of Copenhagen, as “unblinking”. How frightening would it be if, looking out of a photograph from the distance of nearly half a century, the author of such hauntingly strange tales did appear to blink at us? The writings of William Hope Hodgson (1877-1918) have inspired a number of later writers, beginning with the first Carnacki, The Ghost Finder (1913) pastiches of “John Nicholson” (pseudonym of Norman Parcell), Costelloe—Psychic Investigator (1954), which have been followed by a growing number of other Carnacki pastiches, most notably those co-written by A.F. Kidd and Rick Kennett and collected in No. 472 Cheyne Walk (1992; expanded 2002). Hodgson’s The Night Land has been “retold” by James Stoddard in 2011, and Andy W. Robertson edited two volumes of tribute stories, William Hope Hodgson’s Night Lands (Volume I: Eternal Love, 2003, and Volume II: Nightmares of the Fall, 2007). With more originality but still showing Hodgsonian influence, there are Iain Sinclair’s Radon Daughters (1994) and Greg Bear’s City at the End of Time (2008). Now comes Avalon Brantley’s The House of Silence (Zagava, 2017). This edition is limited to only 170 copies, a frustratingly low number because this book deserves a larger readership. One hopes that an affordable paperback may be forthcoming. Yet in general terms The House of Silence is a difficult book to describe and a more difficult book to assess. Some aspects of it are brilliant, while others seem strained by self-indulgence on the part of the author. Ostensibly the book is an example of the found-manuscript trope, and the bulk of the story is purported to have taken place sometime in the late 1940s. It is the first person narrative of Ashley Acheson, who is returning to his boyhood home near Ardrahan in the west of Ireland. Ashley ran away to go to sea when he was thirteen, and this homecoming is brought about because of the death of his father, an Anglican priest. Here you begin to see the resonances with Hodgson’s own life—he ran away at thirteen to go to sea, and for a short while when he was young, he lived near Ardrahan where his father was an Anglican priest for a few years beginning in 1887. Names recur in the novel from Hodgson’s real family—his father was Samuel, mother Lizzie (plus a sister Lissie), and he had brothers Frank (Francis) and Chris. In The House of Silence, Ashley has siblings named Samuel, Lizzie, and Francis, and a cousin Chris. Hodgson published in 1917 a silly poem he wrote called “Amanda Panda.” In The House of Silence, Ashley has written a poem of the same title about a childhood girlfriend named Amanda whom he called Amanda Panda. What the point of all these casual references are I do not know. 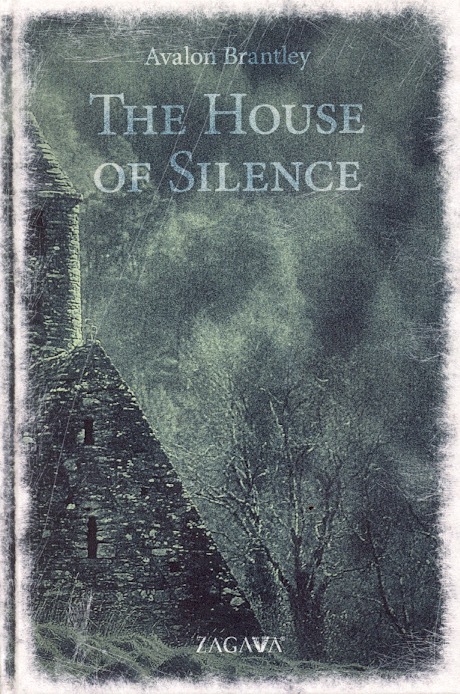 More seriously, The House of Silence evokes the specifics of two of Hodgson’s novels, The House on the Borderland (1908) and The Night Land (1912). The locale of Ardrahan and specifically one unique house comes right out of the former novel and finds its way into The House of Silence. There are other resonances taken right out of The Night Land. What is entirely non-Hodgsonian is the way that Brantley tries to bring what might be called the Hodgson mythos in line with early Irish prehistory, its gods and heroes. It’s an intriguing attempt to align the two together, but I don’t think it works. Indeed, what Hodgson set out to do with The House on the Borderland in terms of cosmic significance seems to work very much against the bringing of any of it together with Irish mythology. The attempt seems to me to diminish the power one finds in Hodgson. Which is not to say that Brantley fails completely. It’s entirely to her credit that she brings it all together as much as she does. Alas, this book is evidently Brantley’s only novel. Just after publication it was announced that she had passed away. Given the details of her life (1981-March 5, 2017) and residence in West Virginia, I could find no corroborating evidence that such a person really existed. For this and other reasons I assume “Avalon Brantley” was a pseudonym. She published two other books, a play Aornos (Ex Occidente, 2013) and a collection of short stories, Descended Suns Resuscitate (Zagava, 2014). I hope sometime we learn the real story behind this author and this book. 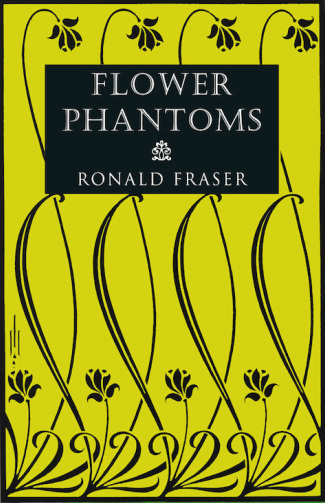 At the Hold Fast Network, the first podcast in a series “unearthing neglected texts from outside the mainstream canon” is devoted to Flower Phantoms by Ronald Fraser, which is rightly evoked as “a curious and unique work that deserves a much wider readership”. 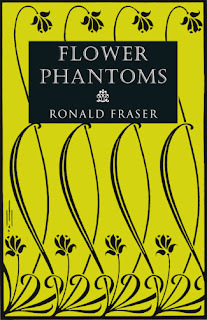 This hour long dialogue is probably the most substantial and thoughtful discussion of this overlooked novella in the 90 years since its publication in 1926, and it is good to see Fraser’s work receiving such recognition and close attention. This is supported by some well-chosen passages from Fraser's lyrical and fervent prose. 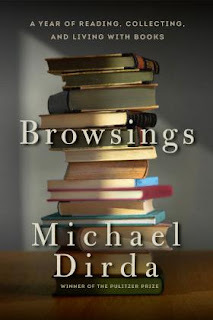 The commentary gives particular attention to the contrasting characters in the book, bringing out some perceptive insights, and also has a probing and sophisticated understanding of the novel’s subtle and strange eroticism. There is also a sympathetic but not uncritical consideration of how Fraser handles the theme of female social liberation and creativity, and humanity's relationship with nature. The mystical dimensions are also treated with respect and an attunement to what the author was trying to achieve. It will be fascinating to follow the further studies in this series. 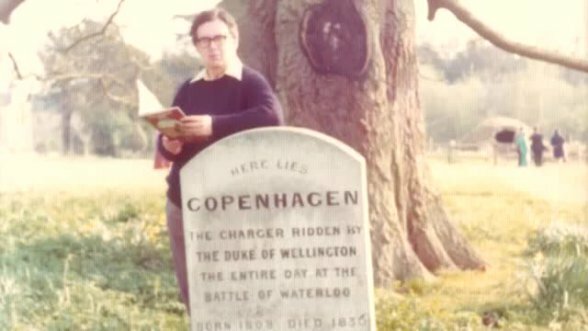 In my account of the author and adventurer Charles Welsh Mason, And I’d Be the King of China (reprinted in Haunted By Books, 2015), I explained that I had first encountered him, under his pen-name Julian Croskey, in a book by Gerald Cumberland. I had been idly scanning the index to his memoir Written in Friendship (1923), when the Croskey entry caught my attention: I had never heard the name before, and so turned to the relevant pages to find out more. That momentary flicker of curiosity was to lead me on a long and strange quest after this most singular figure of the Nineties. At the same time, I also looked into Cumberland who was, as it turned out, Charles Francis Kenyon (1879-1926), a music critic and minor composer, with a few other books to his name. He had also written a lively and faintly sly earlier memoir, Set Down in Malice (1919), which had achieved a brief notoriety for its candid and mildly scathing portraits of weighty cultural figures of the time. He certainly succeeds in that, and the book seems to have been rather more successful than his other work, going into reprints (the dustwrapper here, by Ellis Silas, is from a John Hamilton edition from the 1930s) and also a French translation by Richard de Clerval, Le coffre de cypress (Paris, Librairie des Champs- Elysées, 1930). 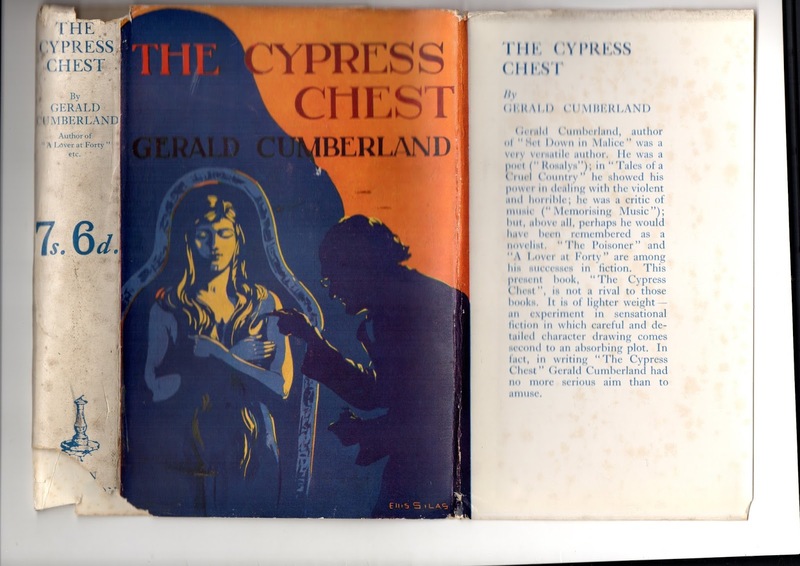 The Cypress Chest is a rather gauche but exotic and pacy detective story in which Percival Boris Maxim, just returned from exploring deepest Africa, goes to his Hertfordshire home and discovers, in an unopened antique chest he bought before he went away, the embalmed body of a beautiful golden-haired girl. He suspects his valet, Soulgrave (a name which has a slightly David Lindsay air about it), of complicity, and decides to investigate the mystery himself. His enquiries lead him to encounters with a sardonic aesthete, a young woman strangely like the one in the chest, and an Egyptologist with a secret. The influence of Stevenson, in his New Arabian Nights mode, seems likely, and Cumberland also knew Machen and may well have enjoyed and aspired to emulate some characteristics of The Three Impostors. The yarn has some supernatural dimensions. Maxim has premonitions and promptings: firstly, to bid for the box at auction, well beyond its value; and again when he passes a country churchyard, to turn in through the lych-gate; so there are hints of the uncanny, as well as the Poe-esque theme. There is also a mystical dimension to the resolution of the plot. This is a briskly written piece of grotesquerie with bizarre characters, a Gothic atmosphere and a certain insouciance in the telling. It may well appeal to readers who enjoyed such tales as R Austin Freeman's The Eye of Osiris (1911), Riccardo Stephens' The Mummy (1912) or the supernatural thrillers of Dion Fortune. Fairies' Song (1906), singing a cappella for two sopranos and two altos.